So I told you I was going to show you another quilt using this simple design – how about two? I love this stripe from Lotta Jansdotter’s newest collection, Bella, and thought it might be a perfect stripe to use with this design. I love that the stripes are a bit irregular, and I really love it in this charcoal color. I think they look quite nice together! I had fun with a little more straight line quilting – single lines about 3/4″ apart for one, and a little twist on that for the second. 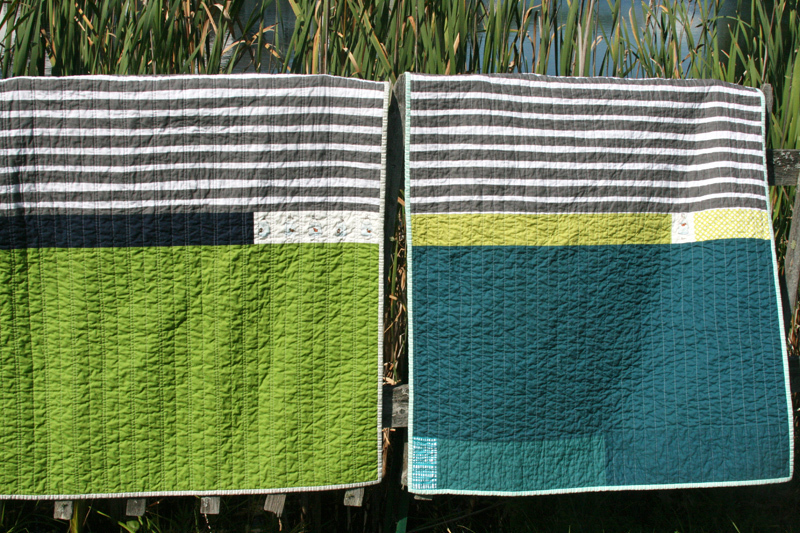 I hope these two new little boys will spend lots of time hanging out on these quilts! 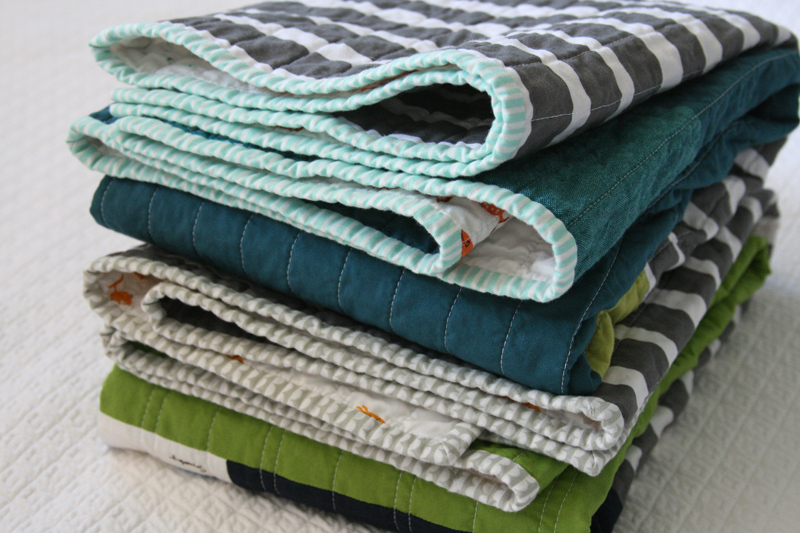 Each quilt measures about 36" x 42/44" or so, which I think is a great size for a new baby. I liked this size for a floor quilt, but also thought it was great for covering up a little one in a carseat or stroller. Need a quick gift and want to make one of these? The top and bottom portion measure about 22" x 37" and the middle strip measures about 3" x 37". Sew those pieces together, back it with a fun print, and voila! cute little baby gift! This entry was posted in [search] Strip Quilts, baby, Fabric, Posts about Quilts and tagged baby boy quilt, baby quilt, goldfish, handmade, Heather Ross, kona solids, lotta jansdotter, quilt, stripe quilt. Bookmark the permalink. I love these almost as much as the orange and aqua one. So simple and effective with cute quirky details. I hope you don’t mind that I pinned it? Every time I see one of your quilts, I think, “this is my favorite!” And then you go and make another one, and I say, “THIS is my favorite!” Hahaha! Love them! oh my word… they’re stunning! those little guys are lucky ducks. oh, my!!! 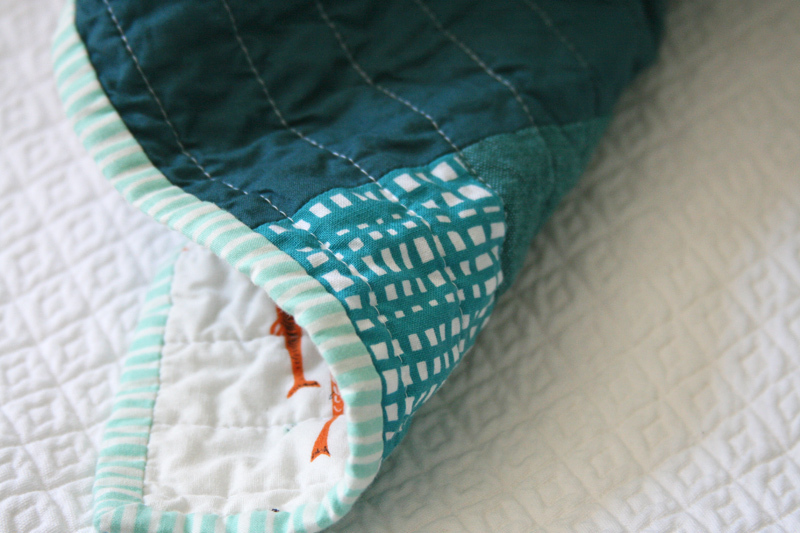 These quilts are so adorable! They are stunning in their simplicity and how wonderfully modern and minimalist they look. I so need to make one, just much bigger. Thanks for sharing. Seriously Ashley, when do you not make cute quilts. They are so perfect! These are so cute. Thanks for sharing the dimensions too. I LOVE them both. What is that dark teal color? Beautiful! Beautiful! Do you know the names of the solid colors? Thanks! The solid green is Kona Lime, paired with a skinny strip of Kona Navy. On the other quilt, the solid blue is Michael Miller Cotton Couture Teal, paired with a skinny strip of Cotton Couture Kryptonite. 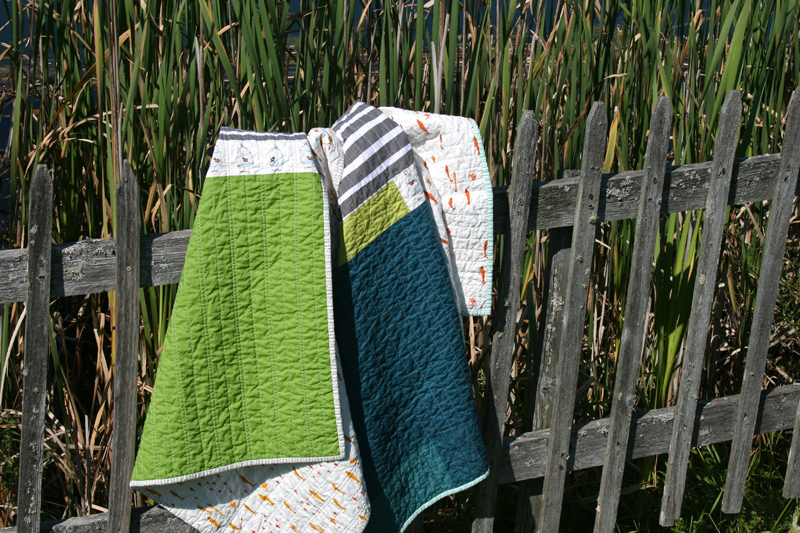 These quilts are great! I love them and they look snuggly. Thanks for the quick tutorial. So very nicely done… Especially for some twins. 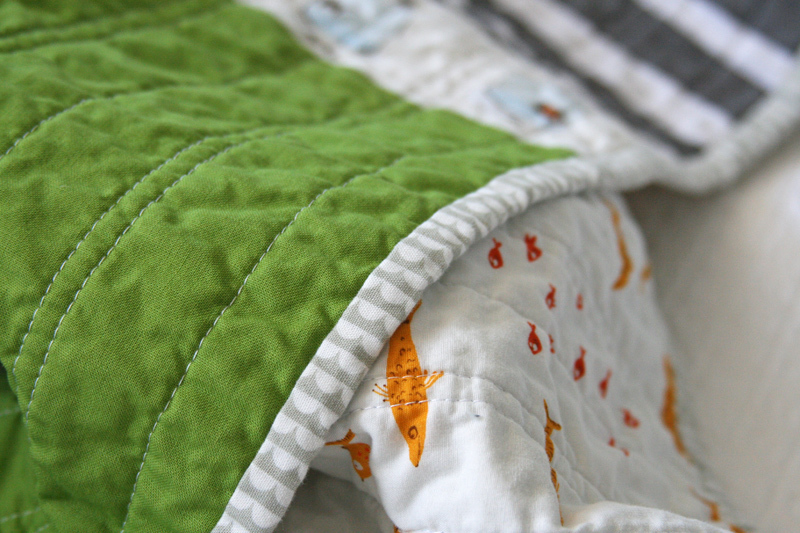 Ashley, I love how you used the Heather Ross prints on these baby quilts. Have you received her latest book/CD yet? I got mine a few weeks ago. I am so excited to be able to print her designs directly through Spoonflower. 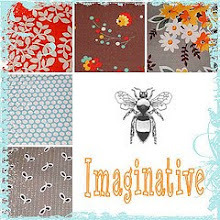 I can’t believe she has “gifted” us permission to use her designs in “every way we can imagine”! The CD at the back of the book, is full of 50-60+ of her different prints and then she goes on to show us how we can make projects with them, explaining the project step by step. For example, making hand towels, printing her designs to wall paper or fabric, making stationary, etc. The fish pattern that you used is one of the many that she has provided to us. I was in complete SHOCK when I saw the book and her generosity. So now, we can print as much of her fabric that we like! Is this how you got your “fishy” fabric? 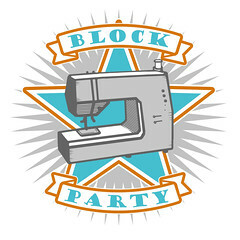 Just curious how it looks through Spoonflower versus off the bolt in the store?? I’m so happy about the sizes. I just finished one 36X45 and thought it looked too narrow. The quilts are cute. I love the simple quilting. Perfect! Adorable. I’ve been liking simpler quilts more and more. Pinning now! I LOVE these! So simple and stunning. I will be making one in the future for sure. I love this simple, friendly design. The colour makes it perfect! 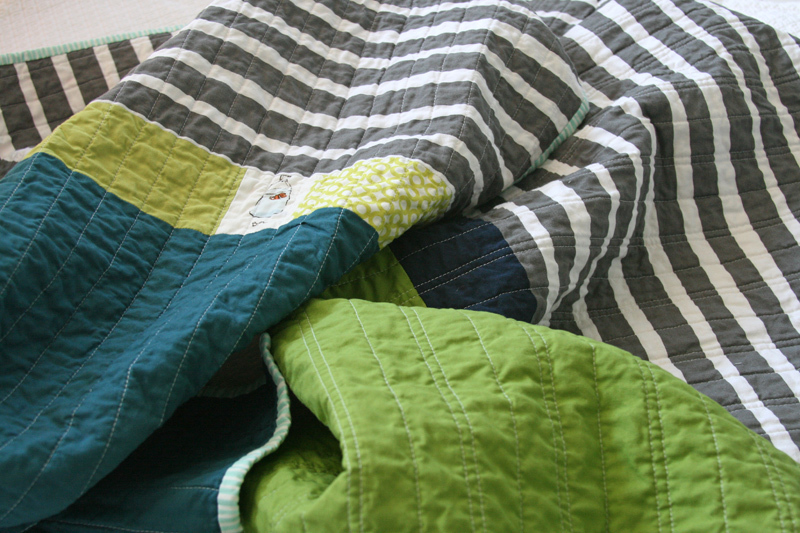 Oh my goodness—I love the gray fabric that you used to bind the green quilt! You wouldn’t happen to remember who makes it would you? Both of these quilts are absolutely beautiful! You are so creative and talented! It’s Sundae, in Bonnie and Camille’s Ruby collection for Moda. I love it too. Your quilts are beautiful! Do you ever take requests and sell your quilts? Would you ever consider making a quilt to purchase? I LOVE your quilts! !